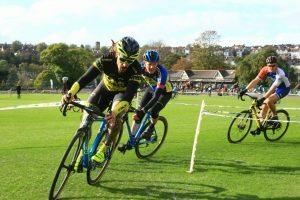 Hosted by Preston Park Youth CC our first Cyclo cross race at Preston Park is set to be a stormer. 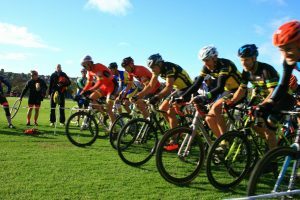 Known for its Criterium series the 63 acre park also boasts enough space for our cross race. The U10/U12 course will stay inside the Velodrome area, which Wikipedia tells us (so it must be true), is the oldest velodrome in the world! 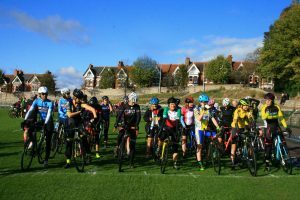 This was the first time a Cyclo Cross race has been hosted at the 140 year old Preston Park Velodrome and what a great event we had. It’s always nice to wake up on a race day after an extra hour in bed and to add to this Ben Tullet, the current World Junior Cyclo Cross champion, turned up to race and could be seen chatting to riders, having his photo taken and allowing many rider to ogle at his lovely team edition Stevens cross bike. As we all know the weather has been exceptional this year, only last week we were racing in full sun and 18 degrees plus. However, Autumn had certainly set in this weekend though as evidenced by the much colder conditions and the amount of leaves that had been shed from the trees. The seasons felt like they had changed in a week. Once the course was laid out for the first time we made some tweaks and once a number of riders had ridden the course, the lines cleared happily leading to racing with no problems at all. From the start line on the back straight of the velodrome it was a full on charge on the inner grass area with a few switchbacks before the course sped through the finish line and then performed a few more switchbacks in front of the Pavilion and a constant number of spectators. The course then exited the track with a 180 degree turn before two flat out tarmac efforts up to the highest point of the course before a fast downhill section into another two 180 degree turns which became more sandy as the race went on, claiming several victims! A tight turn to the left and we were now into the park itself where two lovely flowing descents were split up by fast attacking uphills and a log which was being bunny hopped by the fastest riders. 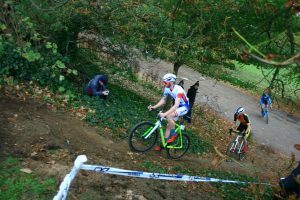 A steep bank with tree roots took us back into the Velodrome to complete the lap in just under 6 minutes. 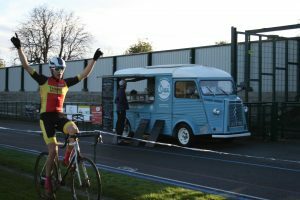 Meanwhile Bill Wright ensured that he set up the finish line and the London and South East Cyclo Cross League Marquee and timing equipment right next to Coops coffee and the Crepes vans. Bill likes crepes and Coffee! 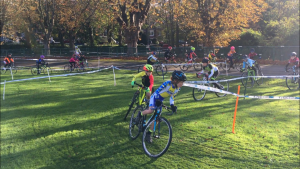 The sunny but chilly day began with the U10/12 guided laps that were focused on training riders on the switchbacks on braking, transitions on tarmac and grass and front tyre grip. This was taken by Tim Sales of British Cycling, Stuart McGhee and help from Bruce Sandell (Southborough and District Wheelers). 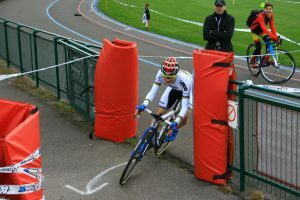 The Under 10 and 12 course was centred inside the velodrome and produced some great close racing. Riders fighting hard to get the hole shot into the first corner and dog leg section. 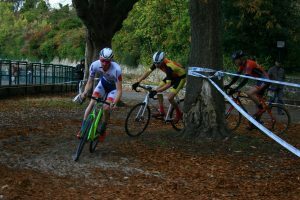 Noah Smith (Team Darenth) used his brute strength after the first lap and put in a big attack on the long grassy back straight that distanced Joe Carpenter (Sutton CC) and Ivo Thwaites (Kent Velo Kids). These three then held these positions to the line. In the girls race Orla Willis (Panagua CC) opened a gap on lap one over Charlie Anastasia Furlong that steadily grew each lap. The real battle was for 3rd place going all the way to a sprint finish which local VC Jubilee rider Lotta Rogers who won against Eva Gibson (Club Cyclopark) these 2 had no time to relax as 5th place was breathing down their necks to the whole race. Oscar Amey (Team Darenth) and Peter Carpenter (Sutton CC) continued their toe to toe battle as seen at every round this season. Each trying hard to put each other under pressure as it’s all about those vital seconds. Oscar put in a few seconds on Peter on lap 4 with his fastest lap of the race and try as hard as he could, Peter could just not bridge the small gap and Oscar reached the chequered flag first. Mak Larkin rode a solid race to secure 3rd place. Tulsi Bakrania (Team Darenth) attacked her team mate Lola Arnold after the first lap and was never seen again to claim a good win. 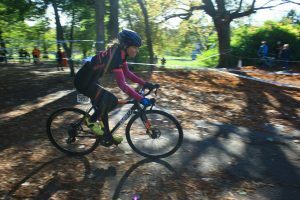 Lola looked safe for most of the race for 2nd place but nearly came unstuck with a late race surge for Molly Jones (Sutton CC) who rounded out the podium . Under 16 Boys – Joe Blackmore (Team Darenth) continued his winning streak by forging a lead early on and increasing it all the time. Luke Hazell (Team Darenth) and Sam McGhee (Sutton CC) were in a battle for 2nd until mid-distance when Luke had the measure of Sam on the climbs and eased away. Luke Prenelle was looking likely to challenge for a podium spot but he had a number of bike issues and visits to the pits that put paid to that. At one point just as he was passing the pits, there was an almighty noise and he came screeching to a halt as somehow his rear mech had exploded and his rear wheel came out of the bike! Under 16 Girls – Emily Lines (WXC Racing) and Amber Junker (Sutton CC) looked set after lap one for a race long battle but Emily just seemed to have the measure of the course over Amber and was able to gain those 7 to 8 seconds a lap to claim a well-deserved win. Amber came home 38 seconds later after 35 minutes of racing with teammate, Penny de Brett rounding out the podium. Under 14 boys Piers Higginson (Team Darenth) Luke Gibson (4t+ Cyclopark) and Dan Levine rounded out the podium spots with the top 5 all within a minute of the winner thus proving to be a very competitive category. A number of riders seemed to lose most of their time in the first lap to only get quicker and quicker towards the end. In fact Owen Prenelle was leading this race and looked a good bet for the win but unfortunately like his brother in the same race had a nightmare of a race and did not finish due to mechanical issues. 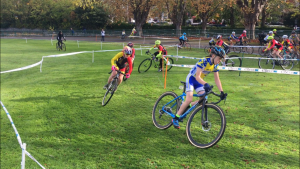 Under 14 Girls – Aofie Bakovic put to good use her training in North Wales in Coed y Brenin earlier on in the week to cross the line first for a great win. She was pushed all the way to line by Hope Inglis (Kent Velo Kids) who was in a close tussle with Lucy Wollaston (Herne Hill Youth) who came home in 3rd place. 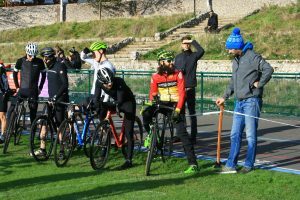 It’s not every day you see a current British World Cyclo Cross Champion on the start line. Ben Tullett (IKO-Beobank) was using the race to test his knee after a nasty fall on a set of hurdles overseas a week or so back. Early diagnosis was a possible fractured knee but we are all thankful that this was not the case. 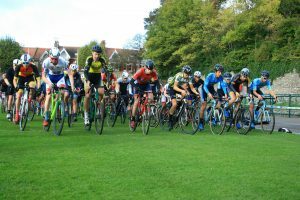 Ben was never likely to be challenged for the win, however Jamie Walker of the Sutton CC and Jack Lear (Southborough and district Wheelers) put up a good fight to get the hole shot. Soon after Ben opened up the after burners and started to forge ahead on the inner part of the velodrome whilst being watched by the Vet40 mens field that would start 2 minutes later. As Ben approached the part of the course that took you out of the velodrome he proceeded to follow the course that led up to the back end of the Vet40 fields waiting to start!! !,… Shock- Horror! – The marshals had not closed this corner off from gridding, in the confusion all juniors were pointed in the right direction with Ben now rejoining at the back, normal order was soon restored however as Ben got back to the front very quickly and was not seen again. Krishan Bakrania (Team Darenth) continued his good form to claim a 2nd place with a fine 3rd place for the organising club Preston Park Youth rider Luca Stone. Straight from the gun the tandem paring of Steve Gibson (4T Velo) and Andy Taylor (C&N Cycles) made light work of the course and opened up a gap on the rest of the field. Then on lap 4 Steve put in the fastest lap of the day at 5.26 (1 sec faster than Ben on the same lap) that broke the elastic. Andy continued on for an unchallenged 2nd place. 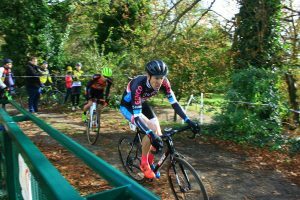 The battle for 3rd place was much closer as Bill Bell (Bigfoot CC) came through the field from a poor gridding position to claim 3rd place in a last few laps battle with James Dear of the Crawley wheelers with the next 7 riders all coming in with a minute of each other. 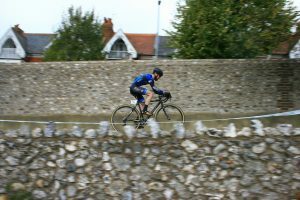 Bill Bell’s 3rd place made all the more impressive after winning the Sussex Nomads Hill Climb just a few hours before with a 4:30 ride up Ditchling Beacon! 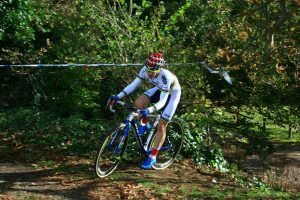 The rain and wind came in force in a section of this race and certainly made some of the transition sections much trickier than they were earlier in the day. Quite a few more riders ended up rubber side up whilst learning the levels of grip they had each lap. What a race though! Some very close racing including a group of 8 forging ahead on lap one. Toby Perry (Thanet CC) and James Flury got a small gap on lap 1 but were always in sight of the group behind so never had the luxury to back off or play games with each other. The group behind whittled down to 3 over the course of the race. Toby put to good use his strength from road racing over the summer months and opened up a gap on the penultimate lap that he held to the finish to win his first Senior race. 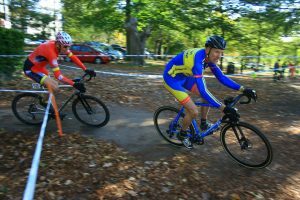 Wilf Sinclair also recovered from an earlier crash on the slippy grass to claim 3rd place from Ed Davies (Dulwich Paragon) and Phil Glowinski (VCL). 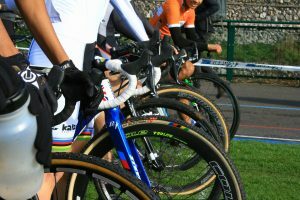 What is cyclocross, and how do you get involved?